I decided this year friends and coworkers would receive shooting related gifts despite their position on guns. I wanted them to all have something that reminds them of me, so after a bit of pondering it occurred to me most are drinkers of some form of alcohol. After a bit of browsing on Amazon I happened across Lucky Shot USA and their line of bullet embedded glasses. When I saw that many of the glasses featured 308 bullets I knew I had found the right gifts. They practically say 308 AR on them :). Anyhow my first purchase and the subject of this post is the .308 Bullet Shot Glasses. I ordered a set of two bullet shot glasses for my boss at the day job and with Prime shipping two days later the shot glasses were in my hands. What is there to say? I absolutely love the glasses as does everyone who has seen them. After I hit the publish button I’m going to order some wine and whiskey glasses. The .308 REAL BULLET shot glass from Lucky Shot USA defies all odds with unapologetic PRECISION, STRENGTH and CRAFTSMANSHIP. 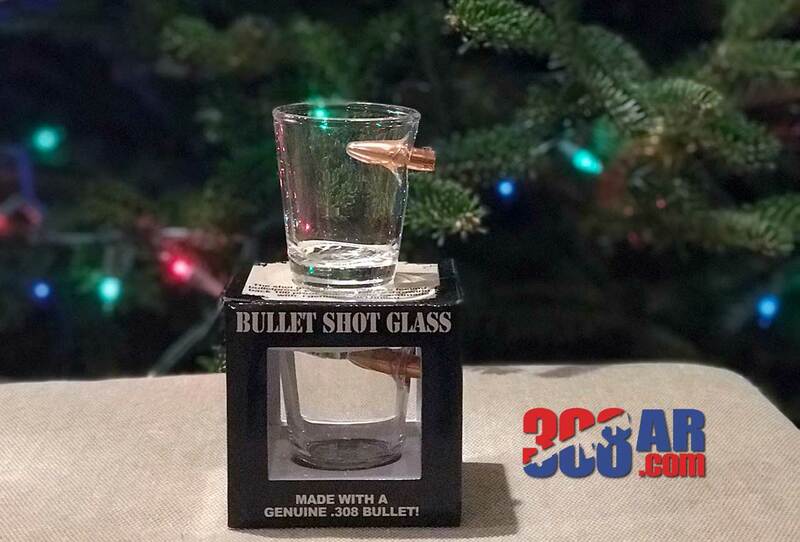 This is no ordinary shot glass—it’s got a genuine .308 bullet stuck in the side! Bite the bullet and find out why Amazon customers made this the #1 drinkware product in its category within weeks of being listed. Each and every glass is hand-blown, which means no two are exactly alike. It’s the only shot glass that’ll leave you feeling BULLETPROOF, even when you’re throwing back 100 proof! Please note this is real GLASS and is not shatterproof or dishwasher safe. Hand wash only to ensure you’ll have it in your arsenal for many memorable nights to come. Don’t be fooled by the impostors… Brought to you by none other than Lucky Shot USA, we present to you the shot glass that defies all odds. Individually handcrafted for superiority, embedded with unsurpassed precision for strength, this is the shot glass that breaks the rules, WITHOUT MERCY.